The Great Baltimore Fire started on February 7, 1904. It spread so fast and was so hard to contain that firefighters were called from as far away as Washington, D.C. to help control the blaze. In the end, over 1500 buildings were destroyed in over 140 acres. I imagine the smoke lingered in the air for quite some time and surely got into pretty, redheaded Mollie White’s eyes, for she met and fell in love with a man named John Brannon. They were married in Baltimore on September 3, 1904. John and Mollie were my great-grandparents. When John Brannon, 22 years old, and Miss Mollie White, who gave her age as 19 years, both of Fairfield, Anne Arundel county, came to Baltimore last Saturday and were married, they expected parental forgiveness on their return home. Instead, it is said, the bride’s stepfather sailed into the groom and gave him a severe beating. The young benedict, it is reported, was so completely taken by surprise that he offered little or no resistance, being distinctly at a disadvantage. He effected a Kuropatkin like retreat, taking the other half of the combination with him. Mr. and Mrs. Brannon now live at Wagner’s Point. In some way, the parents of Miss White learned that she intended to get married, and in order to prevent the match, locked up her best clothing. Nothing daunted, Miss White is said to have met young Brannon and gone to Baltimore in her working attire. There’s not much known of John Clifton Brannon. My grandmother told me that his family came from Philadelphia, although she didn’t know much about him either. For a living, he did odd jobs until he was hired as a merchant seaman by the Southern Transportation Company, out of Philadelphia. He then traveled extensively on an ore barge up and down the eastern seaboard. Although he was gone from home for much of the time he was married to Mollie, they did manage to produce a family of at least 7 children, of which 6 grew to adulthood. They were Lillie (b. 1905) , Jenny (b. abt. 1907), Syvilla (b. 1910) ,John (b. 1911), Sadie (b. 1913) and Brickie (b. abt. 1917). In the 1910 census, John and Mollie were living in the Fairfield section of Baltimore, which at that time was considered to be in Anne Arundel County, not Baltimore. They are listed as having been married for 5 years and have two daughters, Lillie – 4 years old, and Jenny – 3 years old. 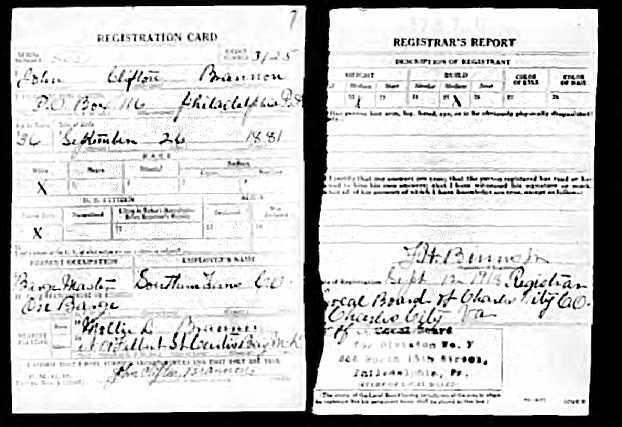 John registered for the WWI draft on September 12, 1918 and stated his birth date was September 26, 1881. His work took him up the James River, as he was in Charles City, Virginia at the time. He listed his nearest relative as Mollie L. Brannon, living in Curtis Bay, MD. 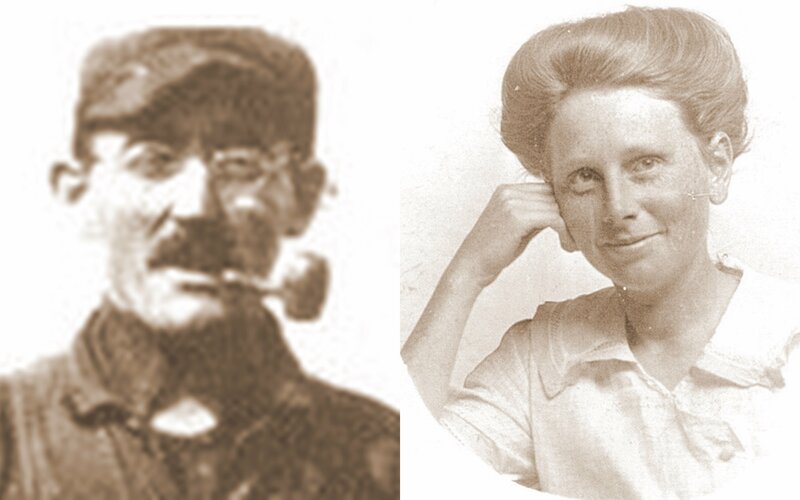 Just two years later, John and Mollie were no longer a couple and John was living in Beaufort, NC in the 1920 census. He listed himself as single, with his occupation being a pipe filer. Mollie remarried and had at least 8 more children; a total of 17 of which 13 lived to adulthood! More about Mollie and the children in a future post. I haven’t been able to find any more information on John. 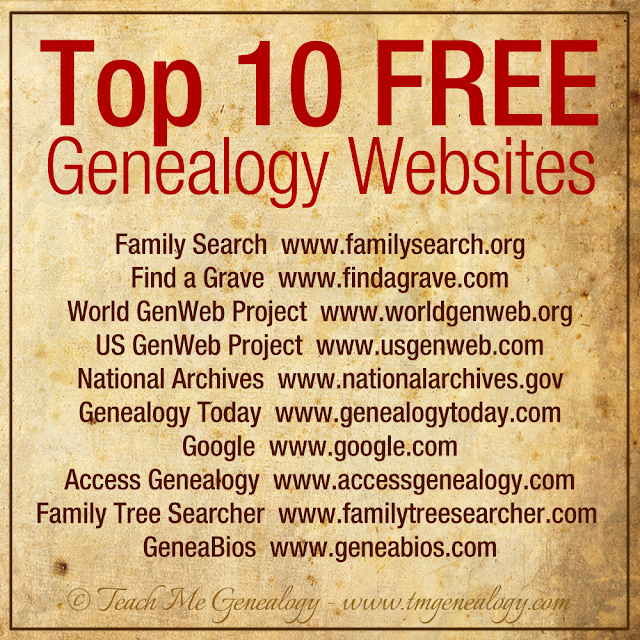 He’s one of my “brick walls.” Do you have any information you could share on this elusive ancestor? What an interesting article you found about their marriage! Thanks, all, for your comments here and on Facebook, about this post. I, too, loved the old newspaper article. I wonder how the incident was reported or who reported it? I have so much more to write about this crazy family, so stay tuned…and thanks for reading!